I love designing yarns. I love spinning yarn. I love testing each new lot of yarn for consistency. I love reeling yarn. I love winding it into little balls or big cakes. I really love making yarn colorful by dyeing it. I love all the weights and measure of yarn. I love getting to know all about a yarns story and what it wants to be. I love matching yarn to project. I love swatching! I really do love swatching to make sure I havethe right yarn and gauge for my project. I love that there is a worsted weight yarn and a worsted spun one. I love that a lot of yarn is twisted, a bit like me! I love the diversity of what we can use to create yarn. I really love wool yarn from all those lovely sheepies! I love the feel of yarn when I am making and wearing it. I love really love the smell of it. I love the people I work with in the yarn industry. I love the mechanics of the yarn industry and it’s history. I love all the fiber artists I get to work with who also love yarn! I love that working with yarn and creating beauty is good for our brains, hearts and souls. I love that yarn brings us together ~ a stunning tapestry of a community ~ loop by loop!! All for which is really great to remember today on YARN Day and also, at a time when our industry and world is experiencing some trying times. Today we are going to celebrate the love and yes, power of YARN! We are going to start with some fun!! Insta-Game ~ (Facebook) with prizes! I am going to post my little “what I love about yarn” paragraph to Instagram and would love for you to comment as to what you love about yarn!! 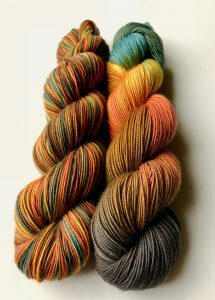 I will randomly pick 10 of you who comment there with your “share yarn love” and send each a skein of Socks that Rock. Oh I will also post this to facebook so if you comment there it also counts toward being eligible for a prize. Starting right now (Saturday, October 13th) we are offering a 13% discount on All YARNS good until midnight Sunday (Pacific Time). Use the code: YARNLOVEDAY18 when you check out to get your discount! I also would love to see what you are knitting with your Blue Moon yarns. If you could post a photo to instagram with the hastags #bluemoonfiberarts and #yarnday so we all can see your creations that would be so wonderful. I can’t tell you how much it brightens our day when you share what you have made with us. After all you are why we do what we do. Otherwise we are just making and coloring yarn to hang in the barn and that is kinda silly! 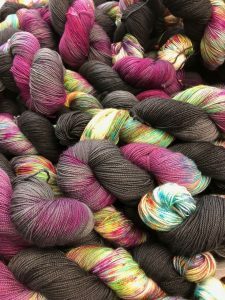 Here is this years Rhinebeck 2018 colorway. I chose to go Autumn hues this year. You can find this colorway along with other of our yarns and tons of samples (including Carol Fellers Tangential Blues pullover) at The Buffalo Wool Company’s booth. Their booth is over by the souvenir shop ans 2 story barn. 22D/OD22-01 Also seriously check out their socks and the colorway I dyed for them on 2 of their lovely yarns! Everyone have loads of fun!! All the Carol Feller KAL yarn that has been ordered has been dyed, dried and shipped! We started shipping RSC ( sock club) on Friday and will continue on Monday! Moon Shadow Anniversary Trio ~ Queen Bee promised the bags this week. After we ship those out we will let you know when the next batch goes. Out of the Hue will also ship next week! As I have said quite a bit during the past few months I am very grateful for you understanding and patience. I am doing my very best juggling dealing with all of the yarn stuff and communicating with you about where we are. We are a very small company and a little smaller than normal right now. So if you have not heard back from em right away it is not because I do not value you. It is seriously just juggling all the yarn balls and making it all work. I personally truly value each and every one of you. I love being a dyer but I also equally love serving you!! Okay I am sure there is more but I need to go do some shipping! !